Yesterday was my rest day so I shot a little running survey video after work. I hope you like it! 1. What was your first ever race like? 2. What is your favorite race ever? 3. Pace group or no pace group and why? 4. What is your dream race and why? 5. Who is your favorite runner/who motivates you? Oh yeah, and I would looooooooove to know if you ran the mile in school and what you thought about it! I’d also love for you to give me calf advice for the millionth time. On Sunday my calves felt a little bit tight before I even started running so I foam rolled the heck out of them. That helped loosen them up a lot and my long run ended up going really well. My calves felt tight for the first mile or so but after that I totally forgot I even had calves! When I got done with the run I felt good, went through my stretching routine and then ate some delicious food. Yesterday morning I woke up and my calves felt tight. As I’m writing this at 11:39pm they are SERIOUSLY tight. Like, I know I could not run right now even if I wanted to because even walking feels weird. I’m hoping this is just a combination of long run + foam rolling but IDK!!!! I’ve never had my calves feel this tight after rolling them, but to be fair I don’t roll them very often. Maybe I should? This pic is cracking me up. THAT FACE. It’s the same look I give when I’m about to start foam rolling. 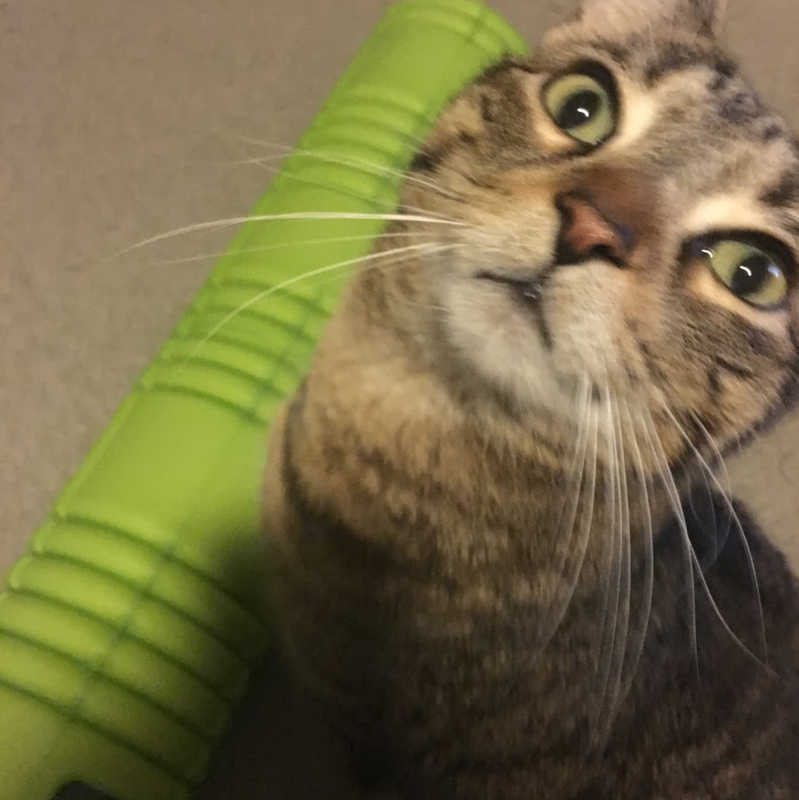 Cute cats aside, do you ever get super sore after foam rolling your calves? What did you think of running the mile in gym class? Previous Post Running, House Hunting, New Trends! “The” mile was the WORST! Truth be told, the mile run was the only test I’ve cheated on in my entire life- and now I’ve run three marathons and five half marathons! I was so slow that most of the other kids were completing their fourth lap (one mile) while I was only completing my third lap (3/4 mile), but I let the coach believe I was done when I crossed! Hahahaha that’s awesome! I always thought about cheating like that but felt guilty! Plus I felt like the coach would know I was cheating since I normally came in way after everyone else. I remember the rest of the class would start walking away either to the locker rooms or to the baseball field/basketball court/tennis courts while I was still during my final quarter mile! It totally wasn’t planned, either – the coach same cross with some other students and said I was done, and I didn’t argue with that! ? I know you’ve talked about tight calves before… do you tend to get them when you increase your mileage? It could be that or it could be shoes too. Do you warm up before running and stretch after every run? I’m guilty of not doing that but I thought it might be a possible reason for your sore calves. I used to wear compression sleeves after long runs and that seemed to help, although it could’ve just been in my head. I hooe you find a solution! Hi Stephanie! I do warm up before and after every single run, but I hardly ever wear compression socks. I have a pair but haven’t worn them in so long. What a great idea to pull them out, they’re worth a try! I’m going to wear them to bed tonight! Fingers crossed! What a great friend!!!! Have you ever read Running with the Kenyans by Adharanand Finn? I think you might like that one too – I’ve read it a couple of times now! Your post reminded me of when I was in grade school. I ran an 8-minute mile. How the times have changed 🙂 my dream race would be to run the Hokie Half in Blacksburg. You get to run through the stadium and it just seems really cool 🙂 so I also tried couch to 5k a few years ago and was horrible with sticking to the plan. I should have registered for a race to hold me accountable. 8 minute mile!!!! Damn, speedy! Running through a stadium would be awesome. I wish the 5K I did actually went through Dolphins stadium. The only race that does that is their charity 5K which required a minimum $300 donation I think to run it. I want to do it one of these years though! Ugh I am sorry your calves are giving you trouble again. I don’t think I can be much help because the only time my calves bother me is when they cramp up during the last 3 miles of a half marathon! It’s kind of my “thing” now. Have you ever been evaluated by a physical therapist for your calf issues??? I will totally do this survey, and hopefully in video format! I hated the mile in gym. Even though I wasn’t a runner, I was pretty good at it, but I remember a girl who smoked beat me and it made me mad! YAY I’m glad you’re going to do the survey and YES pls to video! The only time I’ve been evaluated by a PT for calves was last year when I had piriformis but I don’t think this is piriformis since I don’t have any other symptoms. It’s such a mystery to me right now. I take extensive notes in my training log on the days that they act up and I really can’t figure out what I do differently on the days that they tighten up. I have this weird feeling it might have to do with eating high sodium foods the day before but I don’t know if that’s even a thing, it’s just the only thing I can come up with! Anna Frost for inspiration! She is fun to follow.